Developing countries throughout the world are facing serious social and economic problems which are amplified due to large and diverse populations. Their economies are expanding yet the masses remain largely unaffected. This design brief is not intended to address all problems, but an attempt to resolve specific issues by providing opportunities that will help to improve the quality of life. Positive changes in peoples’ attitudes can promote national pride and increase self respect, leading to economic prosperity. These countries have no shortage of natural and human resources and are well-positioned to transform themselves for the benefit of future generations. Sports Cities are envisioned as master-planned urban communities with an emphasis on sports, fitness and promoting a healthy lifestyle. A wide range of sports activities will be encouraged; training and instruction programs will be implemented; “state-of-the art” facilities will be developed. Healthy bodies are a pre-requisite for healthy minds. Schools for every age group will ensure that children are given the best education by qualified teachers, leading to academic excellence. Sports are a great equalizer in breaking social barriers and promoting harmony among a diverse population. Medical facilities and clinics are needed to encourage health and fitness. Sports Cities will include a fully equipped hospital specializing in sports medicine, physical therapy, nutrition, and also address the general medical needs of residents. A large commercial center will include offices, restaurants, stores and family entertainment venues. Resort hotels with convention facilities will provide guests with accommodations during major sports and entertainment events. Transportation needs will be addressed by appropriate public and private systems. Sports City auto-center will provide comprehensive sales, maintenance and repair services. Master-planned residential communities will be the largest component of Sports Cities. These developments will cover a range of residential models. Luxury homes will surround beautifully landscaped golf courses and tennis courts; duplexes and townhomes will provide smaller units; high-rise apartments will offer unique views of the surroundings. 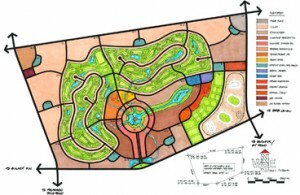 Lakes and water features will provide recreational activities. Each development will contain a park with a community center and club-house for social interaction. Schools will be easily accessible from all residential units. Low-income housing units will be conveniently located within the community. Finally, Sport Cities will require infrastructure that matches the vision. Excellent roads will carry goods and provide essential emergency services. Dependable power supplies will be supplemented by solar and geothermal systems. Waste treatment and water conservation systems will support co-generation plants that will filter pollutants to maintain a clean environment. Sports Cities will become a showcase for these technologies and set the standard for self-sufficient “green” developments world-wide.